Whether you are new to the Hill or simply trying to remember what resources are available to you, we are here to help! Please enjoy and share our Living on the Hill guides, intended to help you find everything you need while visiting or living on Capitol Hill. We love to be a resource to our neighbors so please send us a note through social media or to info@thehillishome.com if you have suggestions for additional guides. 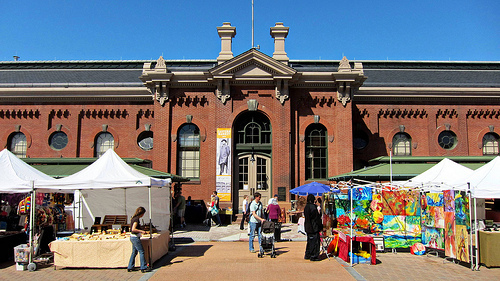 Eastern Market, located at 7th Street and North Carolina Ave SE, is the oldest public market in DC. It was originally built in 1873. A fire destroyed the South Hall in 2007, but with an outpour of support from the community, a revitalized and renovated Eastern Market was reopened in 2009. This historic landmark serves as an important part of community life. Crowds gather on the weekends when the outdoor farmers market, the flea markets and the craft fairs are in full swing. In the South Hall, merchants sell high-quality food such as meats, fish and seafood, poultry, cheese, produce and baked goods. Merchants are open Tuesday to Friday from 7 a.m. to 7 p.m.; Saturday from 7 a.m. to 6 p.m.; and Sunday from 9 a.m. to 5 pm. The North Hall is used to host community events throughout the year and is available to rent. This beautiful and flexible space has been used for awards ceremonies, weddings and private events. For more information on renting out the North Hall for your event, click here. On the weekends, the area along 7th Street SE is filled with merchants for the “farmers line,” who sell everything from flowers to homemade jams and apple cider. The market is also filled with Christmas trees and holiday greenery during the month of December. The Office of Property Management (part of DC General Services) is responsible for the management of Eastern Market and outdoor vending, but not the weekend flea markets. The Flea Markets at Eastern Market are the perfect places to spend your weekend. The flea market managed by Eastern Market itself is right outside, along the 200 block of 7th Street SE; the food court is nearby on the plaza of the Natatorium (William H. Rumsey Aquatic Center). The flea market managed by Diverse Markets takes over 7th Street from Pennsylvania Avenue to North Carolina Avenue. The flea markets are open Saturdays and Sundays from 10 a.m. to 5 p.m.